Summer is my favorite time of year to try out new dinner recipes. It's usually too hot to cook, so I'm always trying to come up with new meals that I can cook on the grill. Insert summer salads. I love summer salads because they're quick and easy, require minimal or no cooking. I'm so excited to share today's recipe because it’s not only light and easy but it’s perfect for summertime dinners. Last week I got a bit lazy and didn't want to cook dinner. You can blame it on the Texas heat, because it just takes everything out of you. I told my husband instead of cooking how about a dinner salad? Well it didn't go quite that way LOL. I just made a salad for dinner, crossed my fingers and hoped for the best. I told him dinner was ready and took my chances. If you knew my husband than you would totally understand. He's a meat and potatoes kind of guy, so having just a salad for dinner is definitely not his thing. My salad of choice was a Barbecue Chicken Salad with a simple dressing. 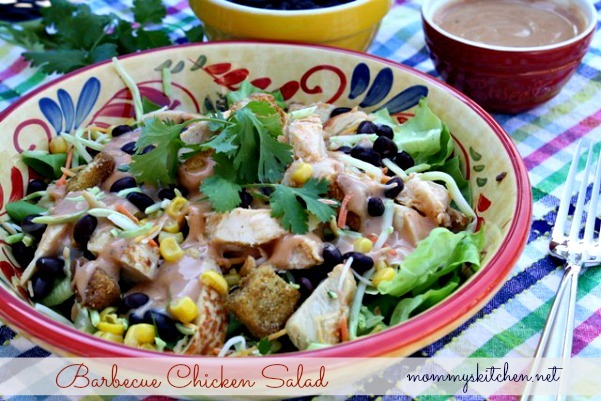 I used store bought pre-cooked chicken, butter lettuce, (you can also use a salad mix), cilantro, broccoli slaw, Mexicorn and Bush's black beans. I wasn't sure about the black beans, but I added them anyways. In an effort to eat healthier beans are a great source of protein and black beans are my favorite. Sometimes I have to try new things with my family or they will never know how good something is. He's also not too keen on ranch dressing in salads, but mixed with barbecue sauce it took regular dressing to a whole new level. It tasted more like a western sauce to me. In the end when dinner was all said and done and I asked him how it was? He said that was really good! I think dinner salads will be making more of an appearance this summer. 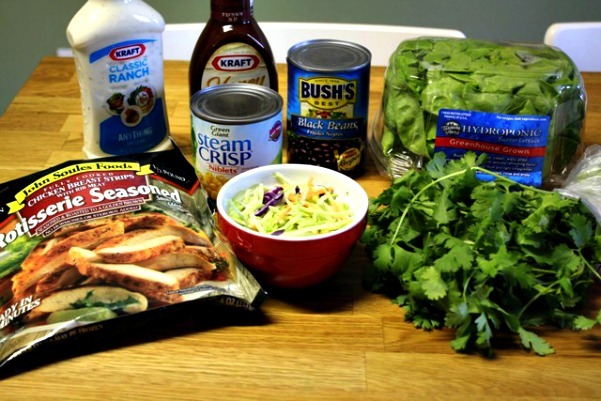 These are the ingredients you will need: Mixed salad greens or butter lettuce, broccoli slaw, cilantro, canned corn, chicken breasts or pre cooked chicken, canned black beans, ranch dressing (regular, light or reduced fat), barbecue sauce and mexican blend cheese (not pictured). If using fresh chicken preheat the grill for high heat. Lightly oil the grill grates. Place chicken on the grill and cook 6 minutes per side and juices run clear. Remove from heat, cool and slice. I used pre-cooked chicken as a time saver. 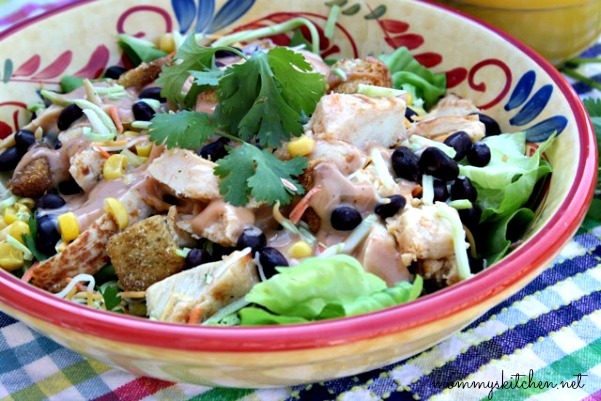 In a large bowl add the mixed salad greens, broccoli slaw, cilantro, corn and black beans. Top with grilled chicken and shredded cheese. In a small bowl combine the ranch dressing and barbecue sauce. Drizzle over the entire salad or serve the salad in individual salad bowls and let everyone add their own dressing. Cook's Note: Rotisserie Chicken can also be substituted for the chicken breasts or prepared chicken. This looks delicious! I love how simple it is to throw together too...great for the summer! I don't think my hubby would be thrilled about salad for dinner either! LOL! But maybe this one could win him over?! This would be delicious with some blue corn chips crunched over the top too! 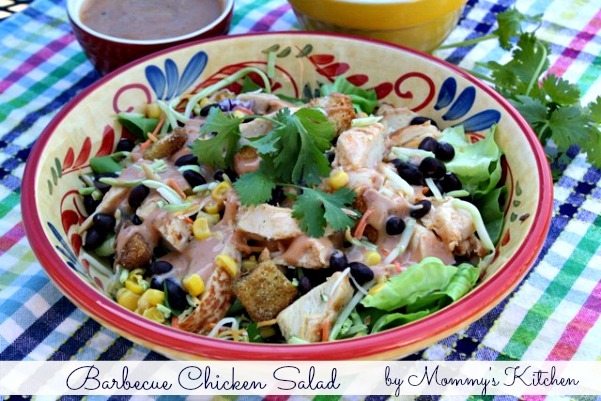 My husband would be thrilled to have a chicken salad anytime! He's much healthier than I am. Lol. However I do have a tip for you. Whenever you grill a protein, grill 2-3 times the amount you need. Just throw them in the freezer. Then you can remove and thaw in the microwave anytime for any number of recipes, including this chicken salad! Much cheaper (yes, I've bought them too! Pretty pricey!) and probably healthier too. Makes chicken burritos so easy! You'll be able to get dinner on the table faster and easier.